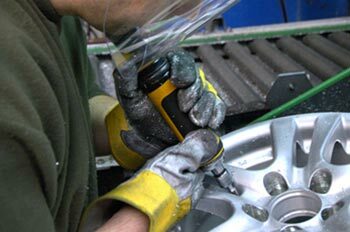 How Alloy Wheels Are Made. WOLFRACE GB – This exciting range is manufactured in Europe, and carries up to a comprehensive FIVE year warranty. have the strict German TUV approval, as well as the KBA (Kraftfahrtbundesamt) certification. 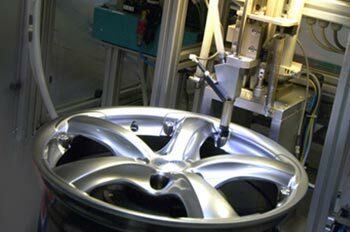 The state-of-the-art European factory manufactures alloy wheels to DIN ISO 9001:2000 standards. The entire manufacturing process, commencing from the original smelting of the ingot to the final inspection of the product is performed in house. Facilities include CAD capabilities for product and tool development, full tool room service for tool and die making, as well as foundry, machine shop, and a sophisticated paint plant. In addition, there is a fully equipped laboratory and testing section, where stringent ongoing testing procedures from raw materials to finished products are carried out. Every finished unit must pass stringent final inspection before it is passed on to you, the customer. Here is a little information which may be of benefit to you on how some of our wheels are made.